Chuck: "Chuck Vs. The Ex"
After last week, it was nice to see things back in their place: Another great week of Chuck; another dose of unabashed nerdiness. In the form of a DeLorean. Whee! See, it's time for Morgan to grow up, and Anna, recently back in the picture, is pushing for him to go out and rent a place for them to share. Problem is, he's got no cash, so Awesome steps in with $2,500 for a security deposit. "Welcome to adulthood," Awesome says with pride as he hands over the check–and for a moment, we believe Morgan is going to do the right thing. (And no one wants to cross Anna, especially after seeing how capable she is at inflicting pain on others.) That is, until Lester and Jeff pull him aside and show him the DeLorean, which some customer has brought in for repair. It's a piece of crap, and can't even get above 22 miles an hour without stalling. But, c'mon it's a DeLorean, and it's for sale. I ask you all… look deep inside yourselves, and tell me you wouldn't do the exact same in his position. That's about it for the Buy More tonight (other than a few flashes of the new, DeLoreaned Morgan–DeMorgan, if you will), which bodes well for the show. The segments have felt tired and ancillary recently, but a singular, honed focus served the subplot well. 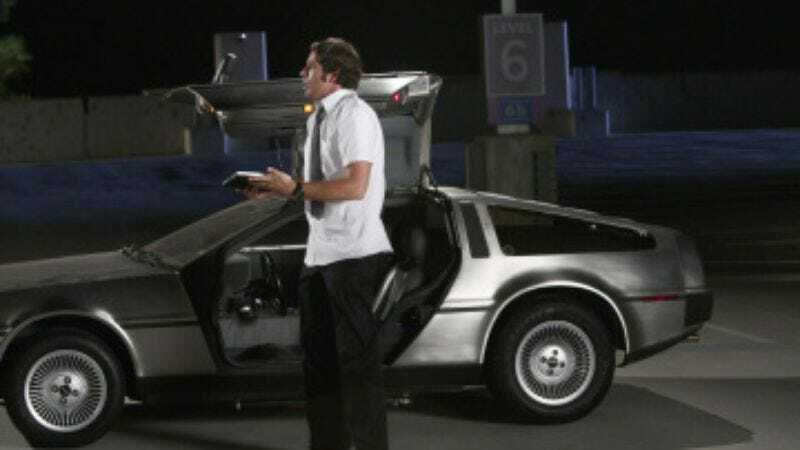 And given that the DeLorean comes back later on, the Buy More stuff felt like it served the greater episode arc well. Most of tonight focused on Sarah and her relationship with her father (Gary Cole, reminiscent of his stint on Arrested Development). A long time ago, they were quite the pair–Sarah would get all fake–run over by an armored car, and dear ol' dad would steal the money. It was their idea of bonding; to each his own. But as we know from before, one of his cons finally caught up with him, and he had to leave Sarah alone. Now he's back, about to pull off the "Mona Lisa" of cons, and he needs Sarah's help. And Sarah, not one to turn down the closest thing she has to family, hears him out. Then came the resolution, which I have to admit I found frustrating. Sarah's dad tells Sarah that he completely trusted Chuck–he made a $10 million gamble that was true, placing the money in Chuck's care in hopes that he'd come back to rescue Sarah–and thus tells her what she already knows. Chuck loves her. She loves Chuck. It worked in "Chuck Vs. The Seduction" because nothing had been said before, and Roan Montgomery, master at reading people, was finally putting it out in the open. But now we're hearing it again, in a similar way as before. I certainly think Chuck and Sarah have some amazing scenes together, and I'm rootin' for them like everyone else, but it's time to see that story play out in a different way. Maybe bringing Chuck's dad into the equation will help, especially in some sort of "My dad can beat up your dad" sorta way. - No Ellie tonight, though I can't say I missed her much. The show's still struggling to find her proper place in the action. - Casey's inexplicable anger over being told he's got a "cop face" was a real treat. - "Ooohhhhhhh yeeeeeaaaaaah… chicka chicka!"